Due to the current functionality and nature of SharePoint & Office 365, customizing these platforms to an organization's needs no longer only affects developers but a much wider range of professionals. It should be on top everyone's mind throughout an organization's hierarchy. 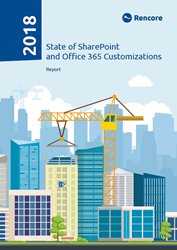 Based on data collected from the survey of the same name, Rencore has announced the publication of the report “State of SharePoint and Office 365 Customizations 2018”. Their 2018 report, like its predecessors, continues to offer an analysis of past, present and future SharePoint usage trends in organizations. It also aims to inform readers about possible customization governance, migration and security best practices based on data collected and the set of hypotheses proposed. “This is our third annual report that provides a deep insight into the way organizations use and customize SharePoint,” said Matthias Einig, CEO at Rencore. “In the past, we targeted a mostly development-oriented demographic, but due to the current functionality and nature of SharePoint and Office 365, and the potential impact customizing these platforms has on data security, we recognize that the customization topic affects a wider range of professionals and should be in the consciousness of many throughout the organizational chain - not just individuals with a technical background." The report provides comprehensive findings extracted from a survey with over 1200 participants. With historic data available from previous surveys done by Rencore, the report also grants a view on trends and preferences within the SharePoint community. In addition to the thoroughly-accumulated stats, the report features an exclusive interview with Christian Buckley, Microsoft Regional Director, Office Servers & Services MVP, and CEO of US-based company CollabTalk, discussing the findings of the report. Buckley recently got ranked the number one SharePoint influencer worldwide. A second exclusive interview features an in-depth discussion between Microsoft MVPs and Rencore product owners Waldek Mastykarz, Tobias Zimmergren and Erwin van Hunen regarding the state of SharePoint customizations. From a Rencore business perspective, the report provides feedback on practices individuals undertake to extend the functionality of SharePoint beyond what is covered by configuration in their day-to-day roles. As a result, the report is highly useful in positioning their own business focus which is providing organizations with SharePoint governance, migration and security solutions. Rencore is the leading provider of software protecting organizations against customization risks in Microsoft SharePoint and Office 365. Their proven suite of products detects and resolves potential security issues and compliance risks caused by custom coded solutions, third-party components, and citizen developers. Rencore's customers are able to comply with regulations more easily, optimize usage of their Microsoft SharePoint infrastructure and pass audits faster and with less effort.